John Calvin (1509-1564) was a prolific writer. He said of himself, quoting St. Augustine, “I count myself one of the number who write as they learn and learn as they write” (Letters, cxliii). It is not that Calvin wrote so much or that he wrote one of those books (Institutes) that significantly impacted the course of history that should be remembered here, it is how and why he wrote. Few people possess his genius or calling. But all of us possess the ability to emulate his style. What is unique about his style? First of all, Calvin was humble. He began with a listening posture. His writing originated from his own personal struggles. He addressed the deepest questions. He realized that he wasn’t the teacher, but that he was the student. “‘God subdued my heart to teachableness'” (p. li). He wrote to learn. Second, Calvin rejected the idea that knowledge could be learned at arm’s length. I see what Calvin is trying to say echoing in Parker Palmer’s To Know As We Are Known. The academy has a hidden curriculum: “We know that students learn as much from the ‘hidden curriculum’ of institutional patterns and practices as from the formal curriculum of concepts and facts, so education would be more truthful if our schools themselves became more reflective of the communal nature of realities we teach in school” (Palmer, p. xiv). In truth, we learn in community and in relationship: “Real learning does not happen until students are brought into relationship with the teacher, with other, and with the subject” (Palmer, p. xvi). Calvin saw this 500 years ago. He believed that we can’t learn without a relationship with god. Calvin rejected “the intellectual indulgence of detached speculation” (p. li). “He never adopts the attitude of the impersonal inquirer. It is not what God is in Himself…that concerns his mind, but what God is in relation to His world and to us. God…makes himself known to those who in worship, love, and obedience consent to learn his will from his Holy Word” (p. li). Thus, when Calvin writes, “The whole work is suffused with an awed sense of God’s ineffable majesty, sovereign power, and immediate presence…” (p. li). “The discerning reader soon realizes that not the author’s intellect alone but his whole spiritual and emotional being is enlisted in his work” (p. li). The point is this. Academic writing in and of itself is limited in its meaningfulness. On the other hand, academic writing that is motivated by love of God and neighbor and reflects one’s heart and mind as well as one’s soul will be far more educational. Third, Calvin’s writing was pious. Before we explore what that means, let’s clarify what Calvin meant by piety. Piousness is “praiseworthy dutifulness or faithful devotion…” (p. lii). “It exists when men ‘recognize’ that they owe everything to God, that they are nourished by his fatherly care, that he is the Author of their every good” (p. lii). Piousness is the opposite of both a sanctimonious or hypocritical display of virtue. Piety is as important today as it was 500 years ago. “‘Today,’ Calvin once wrote, ‘all sorts of subjects are eagerly pursued; but the knowledge of God is neglected….Yet to know God is man’s chief end, and justifies his existence'” (p. lxxi). Thus “the word pietas occurs with great frequency in Calvin’s writings, and in the Institutes it keeps recurring like the ringing of a bell to call us back from the allurements of a secular intellectualism” (p. lii). To put it another way, secular intellectualism makes knowledge or power our god. Calvin wishes to transcend that practice. Fourth, Calvin connects with the reader at a spiritual level. His struggles are our struggles. “Since we ‘owe everything to God,’ in Calvin’s pages we are everywhere confronting God, not toying with ideas or balancing opinions about him. As a result of this, regardless of detailed agreement with the author, the reader finds him the companion of his own religious struggles” (p. liii). Finally, Calvin recognizes that our every good comes from God. In his humbleness he invites the Spirit into the conversation with the reader, especially when it comes to understanding the written Word. “Thus Christ, the Word, by whom all things were created (John 1:1), is the Author of the written Word, by which the eternal Word is known” (p. liv). By extension then, because all the world reflects its Creator, the Word, through us all is reflected a message that says something about God. The biblical writers, then, are not automatons but “persons whose minds and hearts have embraced the truth of what they write” (p. liv). They wrote under the direction of the Spirit and their message must also be interpreted under the direction of the Spirit. Likewise, we are not automatons. When we write and when we read we should also ask for the direction of the Spirit. If we are going to write, let’s write like Calvin. “Not finance. Not strategy. Not technology. It is teamwork that remains the ultimate competitive advantage” (p. vii). 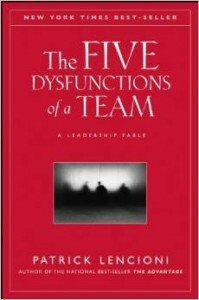 “The most important challenge…is overcoming the understandable hesitance of human beings to givre one another critical feedback….When teammates stop holding one another accountable, what ultimately happens over time is that they lose respect for each other, and those good feelings begin to fade” (p. 63, 64). “Good management is clearly not enough to sustain any organization over the long term…there are real reasons why some organizations may do well over a short period of time but eventually fail: The leadership has failed to create an environment where people really do matter” (George J. Flynn, p. x). “Leaders are the ones who run headfirst into the unknown. They put their own interests aside to protect us or pull us into the future. Leaders would sooner sacrifice what is theirs to save what is ours and they would never sacrifice what is ours to save what is theirs. That is what it means to be a leader. It means they choose to go first into danger, headfirst into the unknown. And when we feel sure they will keep us safe, we will march behind them and work tirelessly to see their visions come to life and proudly call ourselves their followers” (inside book cover). “True human leadership protects an organization from the internal rivalries that can shatter a culture. When we have to protect ourselves from each other, the whole organization suffers. But when trust and cooperation thrive internally, we pull together and the organization grows stronger as a result” (p. 14). “If certain conditions are met and the people inside the organization feel safe among each other, they will work together to achieve things none of them could have ever achieved alone” (p. 15). “Those who have the opportunity to work in organizations that treat them like human beings to be protected rather than a resource to be exploited come home at the end of the day with an intense feeling of fulfillment and gratitude” (p. 16). “Every single employee is someone’s son or someone’s daughter. Parents work to offer their children a good life and a good education and to teach them the lessons that will help them grow up to be happy, confident and able to use all the talents they were blessed with. Those parents then hand their children over to [an educational institution and then] a company with the hope that leaders of that company will exercise the same love and care as they have” (p. 17). “We need to build more organizations that prioritize the care of human beings. As leaders, it is our sole responsibility to protect our people and, in turn, our people will protect each other and advance the organization together” (p. 18). “Intimidation, humiliation, isolation, feeling dumb, feeling useless and rejection are all stresses we try to avoid inside the organization. But the danger inside is controllable and it should be the goal of leadership to set a culture free of danger from each other. And the way to do that is by giving people a sense of belonging. By offering them a strong culture based on a clear set of human values and beliefs. By giving them the power to make decisions. By offering trust and empathy. By creating a Circle of Safety” (p. 22). “[The leaders of great organizations] see the money as a commodity to be managed to help grow their people. This is why performance really matters. The better the organization performs, the more fuel there is to build an even bigger, more robust organization that feeds the hearts and souls of those who work there” (p. 17). “[The] strength and endurance of a company does not come from products or services but from how well their people pull together. Every member of the group plays a role in maintaining the Circle of Safety and it is the leader’s role to ensure they do” (pp. 22, 23). “Letting people into your organization is like adopting a child and welcoming them into your home” (p. 23). “[Having] a job we hate is as bad for our health and sometimes worse than not having a job at all” (p. 28). “[When] our bosses completely ignore us, 40 percent of us actively disengage from our work. if our bosses criticize us on a regular basis, 22 percent of us actively disengage. Meaning, even if we’re getting criticized, we are actually more engaged simply because we feel that at least someone is acknowledging that we exist! And if our bosses recognize just one of our strengths and reward us fro doing what we’re good at, only 1 percent of us actively disengage from the work we’re expected to do” (p. 28). “Leaders, the [Whitehall Studies] showed, have overall less stress levels than those who work for them….The lower someone’s rank in the organizational hierarchy, the greater the risk of stress-related health problems, not the other way around….Those who feel they have more control, who feel empowered to make decisions instead of waiting for approval, suffer less stress” (pp. 29, 30). “We are all social animals….The time we spend getting to know people when we’re not working is part of what it takes to form bonds of trust. It’s the exact same reason why eating together and doing things as a family really matters….The more familiar we are with each other, the stronger our bonds. Social interaction is also important for the leaders of an organization. Roaming the halls of the office and engaging with people beyond meetings really matters” (p. 36). “Two chemicals — endorphins and dopamine — are the reason we are driven to hunt, gather, and achieve. They make us feel good when we find something we’re looking for, build something we need or accomplish our goals. These are the chemicals of progress” (p. 39). “Endorphins serve one purpose and one purpose only: to mask physical pain….The biological reason for endorphins…has to do with survival” (pp. 39, 40). “We can actually develop a craving for endorphins. That’s why people who are in the habit of regular exercise sometimes crave going for a run or getting to the gym to help them relax….” (p. 40). “We are very visually-oriented animals….This is the reason we are often told to write down our goals….This is the reason we like to be given a clear goal to achieve to receive a bonus instead of being given some amorphous instructions….Give us something specific we can set our sights on, something we can measure our progress toward, and we are more likely to achieve it….A good vision statement…explains, in specific terms, what they world would look like if everything we did was wildly successful” (pp. 42, 43). “But there is some fine print at the bottom of the bottle that is often missed. Dopamine is also highly, highly addictive….Cocaine, nicotine, alcohol and gambling all release dopamine. And the feeling can be intoxicating….There is another thing to add to that list of things that can hijack our dopamine reward system: social media” (p. 43). “Accomplishment may be fueled by dopamine. But that feeling of fulfillment, those lasting feelings of happiness and loyalty, all require engagement with others. Though we may not reminisce about that goal we hit a decade ago, we will talk about the friends we made as we struggled to make it. The good news is we also have chemical incentives that reward us with positive feelings when we act in ways that would earn us the trust, love and loyalty of others. All we have to do to get those feelings is to give a little” (p. 44). “Finding, building and achieving are only part of our story. It is the manner in which we make progress that is core to our ability to do well in a dangerous world. It is the selfless chemicals that make us feel valued when we are in the company of those we trust, give us the feeling of belonging and inspire us to want to work for the good of the group. It is the selfless chemicals that keep the Circle of Safety strong” (p. 45). “There to encourage pro-social behavior, serotonin and oxytocin help us form bonds of trust and friendship so that we will look out for each other….When we cooperate or look out for others, serotonin and oxytocin reward us with the feelings of security, fulfillment, belonging, trust and camaraderie” (p. 46). “Serotonin is the feeling of pride. It is the feeling we get when we perceive others like or respect us….Serotonin is attempting to reinforce the bond between parent and child, teacher and student, coach and player, boss and employee, leader and follower” (p. 47). “It is because of serotonin that we can’t feel a sense of accountability to numbers; we can only feel accountable to people….This helps explain why it feels different to cross a finish line alone, without spectators, compared to when a crowd cheers as we break the tape” (p. 48). “The more we give of ourselves to see others succeed, the greater our value to the group and the more respect they offer us. The more respect and recognition we receive, the higher our status in the group and the more incentive we have to continue to give to the group” (p. 48). “Unlike dopamine, which is about instant gratification, oxytocin is long-lasting. The more time we spend with someone, the more we are willing to make ourselves vulnerable around them. As we learn to trust them and earn their trust in return, more more oxytocin flows. In time, as if by magic, we will realize we have developed a deep bond with this person. The madness and excitement and spontaneity of the dopamine hit is replaced by a more relaxed, more stable, more long-term oxytocin-driven relationship” (pp. 49, 50). “My favorite definition of love is giving someone the power to destroy us and trusting they won’t use it” (p. 50). “Not only does the person performing the tiniest act of courtesy get a shot of oxytocin, not only does the person on the receiving end of an act also get a shot, but someone who witnesses the act of generosity also gets some chemical feel good. Simply seeing or hearing about acts of human generosity actually inspires us to do the same” (p. 51). “Oxytocin is also released with physical contact” (p. 51). “Oxytocin boosts our immune systems, makes us better problem solvers and makes us more resistant to the addictive qualities of dopamine” (p. 52). “Unfortunately, many of us work in an environment where members of the group don’t care much about one another’s fate….This is a serious problem. For one thing, cortisol actually inhibits the release of oxytocin, the chemical responsible for empathy. This means that when there is a weak Circle of Safety and people must invest time and energy to guard about politics and other dangers inside the company, it actually makes us even more selfish and less concerned about one another or the organization” (p. 56). “A constant flow of cortisol isn’t just bad for our organizations. It can also do serious damage to our health….It wreaks havoc with our glucose metabolism. It also increases blood pressure and inflammatory responses and impairs cognitive ability….Whereas oxytocin boosts our immune system, cortisol compromises it. That our modern world has seen high rates of cancer, diabetes, heart disease and other preventable illnesses may not be a coincidence” (p. 57). “There is a reason we are so offended by the exorbitant and disproportionate compensations of some of the leaders of investment banks. it has nothing to do with the numbers. It has to do with this social contract deeply ingrained in what it means to be human. If our leaders are to enjoy the trappings of their position in the hierarchy, then we expect them to offer us some protection” (p. 65). 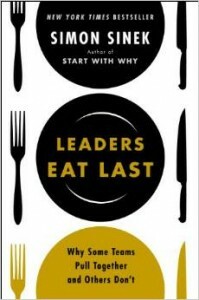 “The leaders of organizations who rise through the ranks not because they want it, but because the tribe keeps offering higher status out of gratitude for their willingness to sacrifice, are the true leaders worthy of our trust and loyalty” (p. 67). “The goal for any leader of any organization is to find balance. When dopamine is the primary driver, we may achieve a lot but we will feel lonely and unfulfilled no matter how rich and powerful we get. We live lives of quick hits, in search of the next rush. Dopamine simply does not help us create things that are built to last. When we live in a hippie commune, the oxytocin gushing, but without any specific measurable goals or ambition, we can deny ourselves those intense feelings of accomplishment. No matter how loved we may feel, we may still feel like failures. The goal, again, is balance” (p. 71). “We don’t just trust people to obey the rules, we also trust that they know when to break them. The rules are there for normal operations. The rules are designed to avoid danger and help ensure that things go smoothly. And though there are guidelines for how to deal with emergencies, at the end of the day, we trust the expertise of a special few people to know when to break the rules” (p. 74). “We cannot ‘trust’ rules or technology” (p. 74). “The responsibility of leaders is to teach their people the rules, train them to gain competency and build their confidence. At that point, leadership must step back and trust that their people know what they are doing and will do what needs to be done. In weak organizations, too many people will break the rule for personal gain. That’s what makes the organizations weak. In strong organizations, people will break the rules because it is the right thing to do for others” (p. 75). “The responsibility of a leader is to provide cover from above for their people who are working below. When people feel they have control over what is right, even if it sometime means breaking the rules, they will more likely do the right thing. Courage comes from above. Our confidence to do what’s right is determined by how trusted we feel by our leaders” (p. 75). For a summary of notes on company building from Jim Collins’ Good to Great, click here. “When you compare great companies with good ones, many widely practiced business norms turn out to correlate with mediocrity, not greatness” (p. 1). “[The] distinction between inputs and outputs is fundamental, yet frequently missed” (p. 4). “A great organization is one that delivers superior performance and makes a distinctive impact over a long period of time” (p. 5). 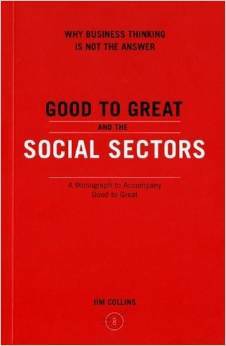 “For a social sector organization…performance must be assessed relative to mission, not financial returns” (p. 5). “It doesn’t really matter whether you can quantify results. What matters is that you rigorously assemble evidence–quantitative or qualitative–to track your progress” (p. 7). “‘You always have power, if you just know where to find it. There is the power of inclusion, the power of language, the power of shared interests, and the power of coalition'” (p. 10). “In executive leadership, the individual leader has enough concentrated power to simply make the right decisions. In legislative leadership…no individual leader–not even the nominal chief executive–has enough structural power to make the most important decisions by himself or herself. Legislative leadership relies more upon persuasion, political currency, and shared interests to create the conditions for the right decisions to happen” (p. 11). “Level 5 leaders differ from Level 4 leaders in that they are ambitious first and foremost for the cause, the movement, the mission, the work–not themselves–and they have the will to do whatever it takes (whatever it takes) to make good on that ambition” (p. 11). “Level 5 leadership is not about being ‘soft’ or ‘nice’ or purely ‘inclusive’ or ‘consensus-building.’ The whole point of Level 5 is to make sure the right decisions happen–no matter how difficult or painful–for the long-term greatness of the institution and the achievement of its mission, independent of consensus or popularity” (p. 11). “If I place a loaded gun to your head, I can get you do to things you might not otherwise do, but I’ve not practiced leadership: I’ve exercised power. True leadership exists only if people follow when they have the freedom not to” (p. 13). “The great companies…focused on getting and hanging on to the right people in the first place–those who are productively neurotic, those who are self-motivated and self-disciplined, those who wake up every day, compulsively driven to do the best they can because it is simply part of their DNA” (p. 15). “First, the more selective the process, the more attractive a position becomes–even if volunteer or low pay. Second, the social sectors have one compelling advantage: desperate craving for meaning in our lives….Third, the number-one resource for a great social sector organization is having enough of the right people willing to commit themselves to the mission” (pp. 16-17). “The essence of the Hedgehog Concept is to attain piercing clarity about how to produce the best long-term results, and then exercising the relentless discipline to say, ‘No thanks you’ to opportunities that fail the hedgehog test.” When we examined the Hedgehog Concepts of good-to-great companies, we found they reflected deep understanding of three intersecting circles: 1) what you are deeply passionate about, 2) what you can be the best in the world at, and 3) what drives your economic engine” (p. 17). “[A] fundamental difference between the business and social sectors [is that the] third circle of the Hedgehog Concept shifts from being an economic engine to a resource engine” (p. 18). “I submit the resource engine has three basic components: time, money, and brand. ‘Time’…refers to how well you attract people willing to contribute their efforts for free, or at rates below what their talents would yield in business (First Who). ‘Money’…refers to sustained cash flow. ‘Brand’…refers to how well your organization can cultivate a deep well of emotional goodwill and mind-share of potential supporters” (p. 18). “The critical step in the Hedgehog Concept is to determine how best to connect all three circles, so that they reinforce each other. You must be able to answer the question: ‘How does focusing on what we can do best tie directly to our resource engine, and how does our resource engine directly reinforce what we can do best?” (p. 22). “By focusing on your Hedgehog Concept, you build results. Those results, in turn, attract resources and commitment, which you use to build a strong organization. That strong organization then delivers even better results, which attracts greater resources and commitment, which builds a stronger organization, which enables even better results” (pp. 23, 24). “[Building a great organization requires a shift to ‘clock building’–shaping a strong, self-sustaining organization that can prosper beyond any single programmatic idea or visionary leader” (pp. 24, 25). “[A] key link in the social sectors is brand reputation-built upon tangible results and emotional share of heart–so that potential supporters believe not only in your mission, but in your capacity to deliver on that mission” (p. 25). “Every institution has its unique set of irrational and difficult constraints, yet some make a leap while others facing the same environmental challenges do not….Greatness is not a function of circumstance. Greatness…is largely a matter of conscious choice, and discipline” (p. 31). “[Non-profit] institutions are central to American society and its most distinguishing feature” (p. xiii). “[Non-profits] do something very different from either business or government…. [A non-profit’s] product is neither a pair of shoes or an effective regulation. Its product is a changed human being. The non-profit institutions are human change agents. Their ‘product’ is a cured patient, a child that learns, a young man or young woman grown into a self-respecting adult; a changed human life altogether” (p. xiv). 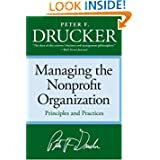 “[Non-profit ] institutions themselves know they need management all the more because they do not have a conventional ‘bottom line.’ They know they need to learn management as their tool lest they be overwhelmed by it. They know they need management so that they can concentrate on their mission” (pp. xiv, xv). “What matters is not the leader’s charisma. What matters is the leader’s mission. Therefore, the first job of the leader is to think through and define the mission of the institution” (p. 3). “A mission statement has to be operational, otherwise it’s just good intentions. A mission statement has to focus on what the institution really tries to do and then do it so that everybody in the organization can say, This is my contribution to the goal” (p. 4). “[So] one asks first, what are the opportunities, the needs? Then, do they fit us? Are we likely to do a decent job? Are we competent? Do they match our strengths? Do we really believe in this?…So you need three things: opportunities, competence, commitment (p. 8). “The most important task of an organization’s leader is to anticipate crisis….One has to make the organization capable of anticipating the storm, weathering it, and in fact, being ahead of it. That is called innovation, constant renewal. You cannot prevent a major catastrophe, but you can build an organization that is battle-ready, that has high morale, and also has been through a crisis, knows how to behave, trusts itself, and where people trust one another….for without trust they won’t fight” (p. 9). “The starting point is to recognize that change is not a threat. It’s an opportunity” (p. 11). “If I were on a selection committee to choose a leader…what would I look for? First, I would look at what the individuals have done, what their strengths are. Second, I would look at the institution and ask: What is the one immediate key challenge? Then I would look for–call it character or integrity” (p. 16). “Most organizations need somebody who can lead regardless of the weather. What matters is that he or she works on the basic competences. As the first basic competence, I would put the willingness, ability, and self-discipline to listen. The second essential competence is the willingness to communicate, to make yourself understood. The last basic competence is to understand how unimportant you are compared to the task….The worst thing you can say about a leader is on the day he or she left, the organization collapsed” (p. 20). “One of the key tasks of the leader is to balance up the long range and the short range, the big picture and the pesky little details…. Another, which I think is even harder to handle, is the balance between concentrating resources on the goal and enough diversification…. The even more critical balance, and the toughest to handle, is between being too cautious and to rash. Finally, there is timing….You know the people who always expect results too soon and pull up the radishes to see whether they’ve set root, and the ones who never pull up the radishes because they’re sure they’re never ripe enough…. Then there is the balance between opportunity and risk….Is it reversible?…Is it a risk we can afford?” (pp. 24, 25). And you need money” (p. 53). “Don’t put your scarce resources where you aren’t going to have results. This may be the first rule for effective marketing” (p. 55). “And then, the second rule, know your customers” (p. 55). “So, the design of the right marketing strategy for the non-profit institution’s service is the first basic strategy: the non-profit institution needs market knowledge. It needs a marketing plan with specific objectives and goals. And it needs what I call marketing responsibility, which is to take one’s customers seriously. Not saying, We know what’s good for them. But, What are their values? How do I reach them?” (p. 56). “The non-profit institution also needs a fund development strategy….Fund-raising is going around with a begging bowl, asking for money because the need is so great. Fund development is creating a constituency which supports the organization because it deserves it. It means developing what I call a membership that participates through giving” (p. 56). “The first constituency in fund development is your own board” (p. 56). “In non-profit management, the mission and the plan–if that is all there is–are the good intentions. Strategies are the bulldozers. They convert what you want to do into accomplishment” (p. 59). “One prays for miracles but works for results, St. Augustine said” (p. 59). “First, the goal must be clearly defined. Then that goal must be converted into specific results, specific targets, each focused on a specific audience, a specific market area…. Next, you will need a marketing plan and marketing efforts for each target group…. Next comes communication–lots of it–and training…. Finally, you ask: “When do we have to see results?” (pp. 63, 64). “The first requirement for successful innovation is to look at a change as a potential opportunity instead of a threat…. Then think through the proper marketing strategy….Look into the possibility of developing a niche” (pp. 68, 69). “The most important tasks in marketing have to do with studying the market, segmenting it, targeting the groups you want to service, positioning yourself in the market, and creating a service that meets needs out there. Advertising and selling are afterthoughts” (p. 74). “The answer marketing gives is that you must formulate an offer to put out to the group from which you want a response. The process of getting that answer, I call exchange thinking. What must I give in order to get? How can I add value to the other party in such a way that I add value to what I want? Reciprocity and exchange underlie marketing thinking” (p. 76). “It’s just more efficient to organize with a notion that you are going to have a long-term relationship with your donors, that you’re going to help them increase their support of the organization” (p. 86). “First of all, what you want to do is acquaint donors with what you are as an organization, what you are trying to get accomplished, so they can identify with your goals” (p. 86). “Development means bringing the donors along, raising their sights in terms of how they can support you, giving them ownership in the outcome of your organization” (p. 87). “So you market research tries to identify two things, to use technical terms: both market segmentation and market value propositions” (p. 93). “You have told us, first of the central importance of the clear mission, and the importance of knowing your market, not just in generalities, but in fine detail. And then of enabling those volunteers of yours to do a decent job by giving them the tools that make it almost certain that they can succeed. And finally, what I heard you say loud and clear is that you don’t appeal to the heart alone, and you don’t appeal to the head alone. You have to have a very rational case, but you also must appeal to our sense of responsibility for our brethren” (pp. 96, 97). What is the Bottom Line When There Is No “Bottom Line”? “Performance means concentrating available resources where the results are. It does not mean making promises you can’t live up to” (p. 108). “Performance in the non-profit institution must be planned. And this starts out with the mission. Non-profits fail to perform unless they start out with their mission. For the mission defines what results are in this particular non-profit institution. And then one asks: Who are our constituencies, and what are the results for each of them?” (p. 108). 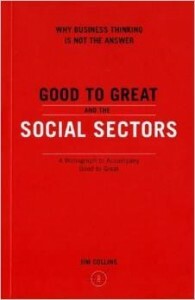 “The first–but also the toughest–task of the non-profit executive is to get all of these constituencies to agree on what the long-term goals of the institution are….What I learned was that unless you integrate the vision of all constituencies into the long-range goal, you will soon lose support, lose credibility, and lose respect” (p. 110). “[Non-profits] have to distinguish between moral causes and economic causes. A moral cause is an absolute good….In an economic cause, one asks: Is this the best application of our scarce resources?” (pp. 111-112). “In every move, in every policy, the non-profit institution needs to start out by asking, Will this advance our capacity to carry out our mission?” (p. 114). “Dissent…is essential for effective decision-making. Feuding and bickering are not. In fact, they must not be tolerated. They destroy the spirit of an organization” (p. 114). “Don’t tolerate discourtesy” (p. 115). “In the information-based institution, people must take responsibility for informing their bosses and their colleagues, and, above all, for educating them” (p. 116). “Organizations are built on trust. Trust means that you know what to expect of people. Trust is mutual understanding. Not mutual love, not even mutual respect. Predictability” (p. 116). “Everyone believes in delegation. But it needs clear rules to become productive. It requires that the delegated task be clearly defined, that there are mutually understood goals and mutually-agreed upon deadlines, both for progress reports and for the accomplishment of the task. Above all, it requires clear understanding of what the person who delegates and the person who takes on the assignment expect and are committing themselves to. Delegation further requires that delegators follow up (p. 117). “An appraisal should always start out with what the person has done well. Never start out with the negative: You’ll get to it soon enough” (p. 120). “The most important part of an effective decision is to ask: What is the decision really about? Very rarely is the decision about what it seems to be about. That’s usually a symptom” (p. 121). There is the irreversible decision, when failure may do serious harm. Finally, there is the decision where the risk is great but one cannot afford not to take it” (p. 123). “You do not prevent disagreement, but you do resolve conflict” (p. 127). “Businesses usually define performance too narrowly–as the financial bottom line….In a non-profit organization, there is no bottom line. But there is also a temptation to downplay results….That is not enough” (p. 139). “One sometimes has to remind them of the Parable of the Talents in the New Testament: Our job is to invest the resources we have–people and money–where the returns are manifold” (p. 140). “Those who have a batting average of almost 1.000 in [people] decisions start out with a very simple premise: that they are not judges of people. They start out with a commitment to a diagnostic process” (p. 145). How have these people done in their last three assignments? Have they come through? Then…look at people’s strengths. What have they shown they can do in their last three assignments? Once you come to the conclusion [that you have the right person], go…to two or three people with whom she has worked” (p. 146). Stage 2: “The second stage comes ninety days later, when you call the newly appointed person in and say….Think through what you have to do to be successful, and come back and tell me” (p. 146). “First, one doesn’t try to build on people’s weaknesses….But if you want people to perform in an organization, you have to use their strengths…. A second don’t is to take a narrow and short-sighted view of the development of people. One has to learn specific skills for a specific job. But development is more than than: it has to be for a career and for a life” (p. 147). “The old rule is, if they try, work with them. If they don’t try, you’re better off if they work for the competition” (p. 150). “Effective non-profit organizations also have to ask themselves all the time: Do our volunteers grow? Do they acquire a bigger view of their mission and greater skill?” (pp. 150, 151). Stage 3: “The more successful an organization becomes, the more it needs to build teams. In fact, non-profit organizations most often fumble and lose their way despite great ability at the top and a dedicated staff because they fail to build teams” (p. 152). “Once the right match is made, there are two keys to a person’s effectiveness in an organization. One is that the person understands clearly what he or she is going to do and doesn’t ride off in all directions. The other is that each person takes the responsibility for thinking through what he or she needs to do the job. That done, the person goes to all the others on whom he depends–the superior, the associates, the subordinates–and says, “This is what you are doing that helps me. This is what you are doing that hampers me. And what do I to that helps you? What do I do that hampers you?” (p. 153). “Are we, in other words, building for tomorrow in our people decisions, or are we settling for the convenient and the easy today?” (p. 155). “To be effective, a non-profit needs a strong board, but a board that does the board’s work. The board not only helps think through the institution’s mission, it is the guardian of that mission, and makes sure the organization lives up to its basic commitment. The board has the job of making sure the non-profit has competent management–and the right management. The board’s role is to appraise the performance of the organization. And in a crisis, the board members may have to be firefighters. The board is also the premier fund-raising organ of a non-profit organization–one important role it does not have in the the for-profit business” (p. 157). “Wherever I’ve seen a non-profit institution with a strong board that gives the right kind of leadership, it represented very hard work on the part of the chief executive officer–not merely to bring the right people onto the board but to meld them into a team and point them in the right direction. In my experience, the chief executive officer is the conscience of the board” (p. 158). “[Quality] control is maintained because of the common vision” (p. 164). “Emphasis in managing people should always be on performance. But, especially for a non-profit it must also be compassionate….People work in non-profits because they believe in the cause. They owe performance, and the executive owes them compassion. People given a second chance usually come through. If people try, give them a second chance. If people try again and they still do not perform, they may be in the wrong spot” (p. 183). “A person is never gong to have a sense of his own, her own, dignity unless they are able to fulfill the expectation of completing the tasks and discharging the responsibilities that they take on” (p. 168). [There] is no greater achievement than to help a few people get the right things done. That’s perhaps the only satisfactory definition of being a leader” (p. 169). “I think a CEO has two primary areas of service. I have to care for the vice-presidents, whom I supervise, and who have no other boss than me. And I have to care for the trustees, who have no other direct and immediate or ongoing contact with the institution besides me and what my office staff does” (p. 174). “We tell bad news at 110 percent and good news at 90 percent in order to compensate for our tendency to cheat, almost unconsciously, because we want to tell the board all the good news and we want to minimize the bad news” (p. 175). “The first priority for the non-profit executive’s own development is to strive for excellence. That brings satisfaction and self-respect” (p. 189). “You cannot allow the lack of resources, of money, of people, and of time (always the scarcest) to overwhelm you and become an excuse for shoddy work….Paying serious attention to self-development–your own and that of everyone in the organization–is not a luxury for non-profit executives…Volunteers, particularly, who don’t get a great deal out of working for the organization aren’t going to be around very long” (p. 189). “You want constructive discontent” (p. 190). “And each of these volunteers sits down twice a year and write a letter to himself or herself (a copy to the [CEO]) answer the questions: ‘What have I learned? What difference to my own life has my work…been making?” (p. 190). “Leadership is not characterized by stars on your shoulder; an executive leads by example. And the greatest example is precisely the dedication to the mission of the organization as a means of making yourself bigger–respecting yourself more” (p. 193). “To develop yourself, you have to be doing the right work in the right organization. The basic question is: “Where do I belong as a person?” (p. 195). “The first step toward effectiveness is to decide what are the right things to do. Efficiency, which is doing things right, is irrelevant until you work on the right things. Decide your priorities, where to concentrate. Work with your own strengths….You identify strengths with performance. There is some correlation between what you and I like to do and what we do well” (p. 198). “I’m always asking that question: What do you want to be remembered for? It is a question that induces you to renew yourself, because it pushes you to see yourself as a different person–the person you can become” (p. 202). “Developing yourself begins by serving, but striving toward an idea outside of yourself–not by leading. Leaders are not born, nor are they made–they are self-made. To do this, a person needs focus. Michael Kami, our leading authority on business strategy today, draws a square on the board and asks: ‘Tell me what to put in there. Jesus? Or money? I can help you develop a strategy for either one, but you have to decide which is the master” (p. 222). What happens when we no longer judge someone as the problem? (p. 6). Refer to Gandhi, the movie. “At this extraordinary moment, control makes a paradoxical shift from the physically dominant man (the policeman) of external authority to the physically wounded man (Ghandi) of internal authority..,,What we have in this scene are examples of two types of change. Incremental changes are those that happen within normal expectations. For the crowd to lose its courage in the face of the policeman’s brutality is an incremental change. It is a relatively small and predictable change. For the policeman to be suddenly frozen in his tracks by a wounded and seemingly powerless individual, however, is an instance of transformational change. It is outside our normal expectations. It is profound change” (pp. 8-9). Three general strategies for change in a normal situation (Chin and Benne 1969) — “telling (making logical arguments for change), forcing (using forms of leverage such as the threat of being fired or being ostracized), and participating (using open dialogue and pursuing win-win strategies)” (pp. 9-12). ACT — “a set of action principles for more effectively introducing change to human systems….’Action from principle, the perception and performance of right, changes things and relations; it is essentially revolutionary, and does not consist wholly with anything that was’….“In the face of principled behavior, the individual observer is constantly required to choose between preservation of the current self or the creation of the new self” (pp. 13-15). “Thoreau’s statement about principle suggests that moral power plays a major role in the transformational process” (p. 17). “To observe transformational capability, we cannot observe normal people doing normal things. We must observe people who are living by principle. To develop transformational capability, we cannot be normal people doing normal things. We must stand outside the norm. To that end we must ask who we are, what we stand for, and what impact we really want to have….The ideas I present here…suggest that the process of significant self-modification and change, of knowing and personifying core values, leads to a sense of empowerment. Empowerment leads to increased experimentation, creativity, learning, and impact. These results, in turn, lead to the development of unique characteristics and the capacity to transform human contexts” (p. 19). “Productive community is a synergistic community, made up of groups of people who are becoming more inner directed and other focused. In this community the common good and the individual good overlap. There is clear purpose and structure. There is high cohesion and responsiveness” (p. 119). “The three change agents see a system of relationships in which the members share a common purpose and each works for the benefit of all…[productive communities]. When people become members of productive communities they tend to become more inner directed and other focused. They tend to be motivated by a calling that they feel deep within . They make contributions that exceed narrow self-interest. People in productive communities also have another unusual characteristic. They want to be connected to reality. They want to know what is real, even if the news is bad” (p. 28). “…none of the change agents say anything about abolishing hierarchy” (p. 29). “…sacrifices led to increased commitment. The increased commitment resulted in new behavior, and the new behavior changed the vision. She could now see potential no one else could see” (p. 31). Note the differences between frozen bureaucracy, dynamic hierarchy, structured anarchy, and chaotic anarchy. Note that there are positive and negative forms of bureaucracy and adhocracy (p. 40). “He was beginning to see that fear of punishment and sense of inadequacy had caused him to get stuck. He had lost his sense of meaning. He was not growing….The notion of growing is key to understanding a basic truth — that when we experience meaning, we are in the process of becoming” (p. 44). “I think by community Palmer means a collection of human beings who can effectively pursue a common purpose while also growing individuals” (p. 48). “In asking ‘What is the right thing to do?’ the transformational change agent is asking a second critical question: What result do I want? Such change agents are not asking How do I get what I want?…Transformational change agent is willing to go outside his or her defined position and violate expectations in order to originate productive community” (p. 53). “I would suggest that we do not find a purpose: a purpose finds us. The process does not begin with some kind of goal-setting process. It begins by making fundamental choices about our own life and what we stand for….” (p. 61). “Clarifying our purpose and committing to pursue the highest in us is transformational” (p. 64). “[We] need to look within for at least two reasons. The first has to do with purpose: making fundamental choices about who we are. The second involves realigning our behavior accordingly. By honoring and acting in alignment with our ideals, we grow within and increase what Gandhi called “soul force….The clearer we are about ourselves, the greater our capacity for change. Instead of responding in expected ways, we can step outside of our routines. Instead of reacting as expected, we choose our response to meet present circumstances” (p. 68). “With most change, it is a challenge to awaken the conscience…. [The story of Jesus halting the stoning of the adulterous woman] illustrates the powerful impact that moral leadership can have in the transformational process” (p. 72). “Argyris..believes there is a universal pattern in professional life. He says that we tend to organize our lives around four basic values. We strive to (1) remain in control, (2) win, (3) suppress negative feelings, and (4) pursue rational objectives. In light of these values, any suggestion of failure is going to feel like a threat. We avoid negative feelings through ‘dissociation,’ that is, by separating ourselves from anything that might cast us in a less favorable light. Ironically, we shut down at the exact moment that we most need to be open to learning. In doing so, we begin the process of stagnation, or slow death” [Recall The Man Who Listens to Horses story]” (p. 73). “What is the bottom line? As painful as it might be for us to accept, the truth is that we are all hypocrites. And this is information that we either do not know or do not want to know. Why? Because we value control, winning, suppression of negative feelings, and the pursuit of rational objectives, we find ways to neutralize the slightest signal that we might be making a mistake or failing. We resist any evidence that we might be less than perfect. Our hypocrisy leads to dysfunctional behavior in our relationships with others….The channels of communication get distorted. The system does not grow. We keep exerting authority in order to preserve our positive self-image, at least in our own minds. However, the more we do this the more disconnected and ineffective we become….We project our dark feelings on others. Implicitly or explicitly we say, ‘You were responsible’” (p. 75). “Whenever I am in a change situation, I almost always ask the terrible question: How am I practicing hypocrisy in this situation?” (p. 84). “When we learn the whole story [feeding the five thousand and departing to the mountain) we discover that he was committed to being internally and not externally driven. It was important to him that he remain very clear about who he was and what results he wanted….Like Jesus, Gandhi understood how external sanctions can shape our lives and divert us from our true purpose. He saw that to be internally driven one had to listen to one’s conscience….Like Gandhi, Dr. King understood that most of us, even though we might deny it, are driven by fears of what will happen to us if we fail to conform to the will of the system. He also understand that suppressing our fears only caused them to multiply. 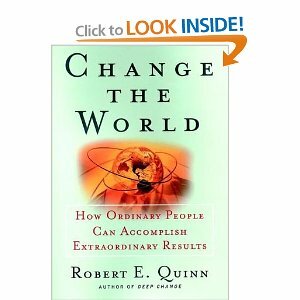 He argued that we need to bring those fears to the surface and face them head on” (p. 89). “What are the shackles that hold us? One of the most central is the need for social approval” (p. 90). “At the personal level, my frustrations over feeling powerless tend to turn into more serious problems. My self-image grows increasingly negative. I see myself as a person of little value. My behaviors reflect those feelings. I then attract people who also have a negative self-image and who need to feel superior. We form co-dependent and often abusive relationships” (pp. 92-93). “The individuals, groups, teams, and organizations will not change until they can identify and embrace their potential, that is, really grasp what they are capable of achieving. This will not happen until one person, somewhere, makes a fundamental choice and begins to demonstrate a new way of being” (p. 94). “Our social fears generally have to do with wanting to be perceived as competent and being accepted as a contributing member of the group. Within any organization upon which we are dependent for our well-being, we are naturally going to be concerned that the authority figure sees us as competent. In fact, one of our greatest fears is failing to meet up to the expectations of an important authority figure” (p. 94). “Notice that Dr. King does not tell us that we should be without fears….Transformational people have many fears and they are willing to admit to them” (p. 95). “The paradox is that if we hold onto the scripts that got us to our present level of wealth and status, we will lose wealth and status. Wealth and status are not the ends for which we are on the earth. We are here to seed the universe, to contribute to the emergence of the larger systems in which we exist. That requires that we transcend our old scripts…. It is only by letting go of our desires for wealth and power that we grow” (p. 104). “When we create, we claim the role we attribute to God. In most traditions, God is defined as the great creator, the original cause of the process from which we emerge. Now, as inner-directed and other-focused originators, we become one with the great source” (p. 105). “Practicing transcendence by progressively letting go of object reference is not easy task. For most of us, it is impossible until we find a unique mission….’Based on all the good and bad things that have happened in your life, what unique mission have you been prepared to serve that no one else can serve?…. [Frankl] noted two points that are relevant here. First, that people are always free to choose [how they will respond]. Second, having a sense of purpose give us the strength and the capacity to transcend even very abusive and even life-threatening situations” (p. 106). “Our lives are no longer determined by the scripts assigned by the group. We become the authors of our own stories. In doing so, we violate the key assumptions of the social sciences and the key assumption of the people around us: We are transcending our own culture” (p. 113). “The madness of the world rages all around, yet in places and events influenced by the apprentice of Jesus, we see God’s heart made visible. When this becomes our goal, we dispel any thought that is just another form of self-actualization or personal development. Thankfully, the objective is more magnificent than that. Ultimately, we seek first the kingdom of God. This was the unifying vision that knit together everything Jesus said and did” (Upended, p. 23). We each have a kingdom to manage: when we “choose to align our influence with God’s will, the good that He intended for us from the beginning springs up” (Upended, p. 23). “Why is it necessary to embody the common good? Becoming the personification of the vision inspires others. They are lifted to new behaviors by our behavior. In witnessing our courage, they take courage. As they engage in new patterns of behavior, a new community begins to arise” (p. 120). “There is a saying that perception is projection, meaning that the world we perceive is one that we have molded by projecting our beliefs onto it” (p. 121). “I believe everything I have learned about the problems of organizations can be stated in a single sentence: In organizations, individuals often choose personal good over the collective good” (p. 124). “When someone in the good chooses personal good over collective good, we sense that we are all being cheated….In an organization, when someone chooses personal good over collective good, trust begins to wither. Commitment and cohesion begin to disintegrate….The same deterioration occurs when the organizational good is chosen over the good of the larger society….People in the organization do not like how they must now see themselves. They practice denial. Everything becomes more transactional” (p. 125). “In organizations, transformational change agents do not seek to maintain equilibrium as managers are typically trained to do. Instead, they seek to understand the system deeply and the individuals who are such integral parts of it. Then they try to disrupt the system so that participants must step outside their scripts, pay attention to what is happening right now, and engage in new behaviors” (p. 162). “Resistance is not where transcendence ends or even where it stops off for a while, but where it begins….Think of resistance as a feedback loop in which the change agent and the resisting system are joined in creative tension. One is the acorn and one is the soil. As they interpenetrate, they gain the potential to move to still another level of complexity and integration. A self-organization system is in place. Those who know how to facilitate significant change no only don’t avoid resistance, they seek it, knowing how essential it is for the transformational process to be successful” (pp. 167-168). “So in the end, systems move to new levels of complexity because they are disturbed. Yet the basic irony about all this, since systems are designed to prevent disturbances, that is, to help each person within the system maintain a steady course. Even so, human collectives can never transform until someone cares enough, and dares enough, to deviate and disturb them” (p. 169). “Now here’s a heretical thought. Leadership is not about results. It is about commitment….Most people want to be told how to get extraordinary results with minimum risk….Leadership means go forth and die. Normal people do not do it because they have nothing worth dying for. The transformational person will argue: ‘Until we have something worth dying for, we have nothing worth living for.’ Transactional people often life lives of ‘quiet desperation.’…The transformational person is focused on something bigger than self. One of the most incomprehensible aspects of the transformational perspective is that personal survival is not the first law of nature” (pp. 179, 183). “I believe that perfection is a dynamic state that we enter whenever we are closing one of our integrity gaps, thus becoming more perfect. When we exercise the courage to close an integrity gap, we experience victory over the self and become connected to a deeper reality. We also gain increased moral power. People see and are attracted by our increased integrity” (p. 193). “They ignite our passion and inspire the best in us” (p. 3). “Great leadership works through the emotions” (p. 3). “No matter what leaders set out to do — whether it’s creating strategy or mobilizing teams to action — their success depends on how they do it” (p. 3). “The emotional task of the leader is primal — that is, first — in two senses: It is both the original and most important act of leadership” (p. 5). “The key, of course, to making primal leadership work to everyone’s advantage lies in the leadership competencies of emotional intelligence [EI]: how leaders handle themselves and their relationships” (p. 6). “The leader can add the strongest flavor to the emotional soup of a group. The leader can set the emotional standard” (p. 8, 9). “How people feel about working for a company can effect performance by 20-30 percent” (pp.17, 18). “In any work setting, the emotional and the business impact of a dissonant leader can be gauged easily…People feel off-balance, and thus perform poorly” (p. 19). “[The resonant leader] was attuned to people’s feelings and moved them in a positive emotional direction. Speaking authentically from his own values and resonating with the emotions of those around him, he hit just the right chords with his message, leaving people feeling uplifted and inspired even in a difficult moment. When a leader triggers resonance, you can read it in people’s eyes: They’re engaged and they light up” (pp. 19, 20). “Each of the four domains of emotional intelligence — self-awareness, self-management, social awareness, and relationship management — adds a crucial set of skills for resonant leadership” (p. 30). “In short, self-awareness facilitates both empathy and self-management, and these two, in combination, allow effective relationship management. EI leadership, then, builds from a foundation of self-awareness. Self-awareness — often overlooked in business settings — is the foundation for the rest: Without recognizing our own emotions, we will be poor at managing them, and less able to understand them in others” (p. 30). “Simply put, self-awareness means having a deep understanding of one’s emotions, as well as one’s strengths and limitations and one’s values and motives” (p. 40). “From self-awareness — understanding one’s emotions and being clear about one’s purpose — flows self-management, the focused drive that all leaders need to achieve their goal. Without knowing what we are feeling, we’re at a loss to manage those feelings. Instead, our emotions control us” (p. 45). “Social awareness — particularly empathy — supports the next step in the leader’s primal task: driving resonance. By being attuned to how others feel in the moment, a leader can say and do what’s appropriate, whether that means calming fears, assuaging anger, or joining in good spirits. This attunement also lets a leader sense the shared values and priorities that can guide a group” (p. 30). “After self-awareness and emotional self-management, resonant leadership requires social awareness or, put another way, empathy. The ability to empathize, in its most basic form, stems from neurons in extended circuitry connected to, and in, the amygdala that read another person’s face and voice for emotion and continually attune us to how someone else feels as we speak to them” (p. 48). “Finally, once leaders understand their own vision and values and can perceive the emotions of the group, their relationship management skills can catalyze resonance. The guide the emotional tone of a group, however, leaders must first have a sure sense of their own direction and priorities — which brings us back again to the importance of self awareness” (p. 31). “Managing relationships skillfully boils down to handling other people’s emotions. This, in turn, demands that leaders be aware of their own emotions and attuned with empathy to the people they lead” (p. 51). How healthy is your self-image? How much do you show evidence of possessing a drive to improve your own performance? How well do you control your own anger and frustrations? How free are you of self-destructive habits and addictions? How able are you at adapting to changing situations? How self-disciplined are you at being able to sacrifice your lifestyle now in order to work for a reward you won’t see for many years? How much have you proven to have the ability to show initiative? How well do you handle personal setbacks? How good is your reputation for understanding other people’s point of view? How naturally aware are you of the characteristics and culture of a group of people? How naturally aware are you of the feelings and needs of others? How able are you at resolving conflicts with people? How well can you inspire others with an idea? How easily are you able to make friends? How much are you able to initiate change in an organisation? How is your ability to win a debate whilst remaining friends? How much do you naturally attract people around you? How much do people naturally look to you for strength and leadership during times of change? “If you’re a leader, you want to be the boss people want to work for, which means someone who cares about me, understands me, who’s going to help me do better instead of just look at how I’ve blown it” (http://www.danielgoleman.info/daniel-goleman-the-one-reason-why-people-dont-want-to-work-for-you/). “[Educators] of all sorts are in real pain these days and that pain has compelled them to explore unconventional resources” (p. ix). [Teachers] know that students are often served poorly in classrooms, and that their own growth as teachers is not supported by the system (p. x). “Everywhere I go, I meet faculty who feel disconnected from their colleagues, from their students, and from their own hearts. Most of us go into teaching not for fame or fortune but because of a passion to connect” (p. x). “[The spiritual traditions] build on the great truth that beneath the broken surface of our lives there remains — in the words of Thomas Merton — ‘a hidden wholeness.’ The hope of every wisdom tradition is to recall us to that wholeness in the midst of our torn world, to reweave us into the community that is so threadbare today” (p. x). 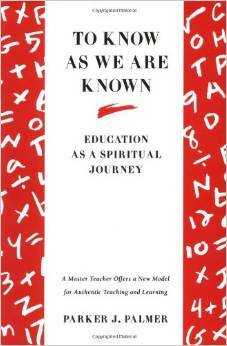 “A spirituality of ends wants to dictate the desirable outcomes of education in the life of the student. It uses the spiritual tradition as a template against which the ideas, beliefs, and behaviors of the student are to be measured. The goal is to shape the student to the template by the time his or her formal education concludes. But that sort of education never gets started; it is no education at all. Authentic spirituality wants to open us to truth — whatever truth may be, wherever truth takes us….By this understanding the spirituality of education is not about dictating ends. It is about examining and clarifying the inner sources of teaching and learning, ridding us of the toxins that poison our hearts and minds” (xi). “[Authentic spirituality] will understand that fear, not ignorance, is the enemy of learning” (p. xi). “To teach is to create a space in which the community of truth is practiced” (p. xii). “We know that students learn as much from the ‘hidden curriculum’ of institutional patterns and practices as from the formal curriculum of concepts and facts, so education would be more truthful if our schools themselves became more reflective of the communal nature of realities we teach in school” (p. xiv). “In the popular imagination, knowing is seen as the act of the solitary individual, a knower who uses sense and intellect to apprehend and interpret objects of knowledge ‘out there.’ Not only does this knower operate apart from other knowers, he or she is also set apart from the known object in order to guarantee that our knowledge will be ‘objective’ and pure. The popular image of how we know reality is as non- or anti-communal as is the popular image of the nature of reality itself” (p. xv). “We now see that to know something is to have a living relationship with it — influencing and being influenced by the object known” (p. xv). “If we could represent knowing for what it is – a way of creating community, not destroying it — we would draw more young people into the great adventure of learning” (p. xvi). “Real learning does not happen until students are brought into relationship with the teacher, with other, and with the subject” (p. xvi). “The way we teach depends on the way we think people know; we cannot amend our pedagogy until our epistemology is transformed” (p. xvii). “We do not learn best by memorizing facts about the subject. Because reality is communal, we learn best by interacting with it….In a wide variety of ways, good teachers bring students into living communion with the subjects they teach” (p. xvii). “Are [our students] simply learning to compete for scarce rewards as isolated individuals, or are they learning how to create communities in abundance in their lives both as learners and as citizens” (p. xviii)? “Critical thinking can be taught as a mode of citizen participation, and tolerance of ambiguity can be taught as a way of listening to others without losing one’s voice” (p. xviii). “[The central claim of the Christian tradition] is not that God takes us out of ourselves and our world into ethereal realms, but that God broke in to reveal us and our world as we are: ‘And the Word became flesh and dwelt among us, full of grace and truth’ (John 1:14). In this movement Spirit and matter were fused and made whole; the distinction we make between sacred and secular was overcome; self and world were permeated with transcendent possibility, the possibility of love” (p. 14). 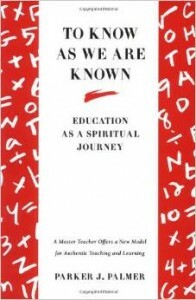 “Where conventional education deals with abstract and impersonal facts and theories, an education shaped by Christian spirituality draws us toward incarnate and personal truth. In this education we come to know the world not simply as an objectified system of empirical objects in logical connection with each other, but as an organic body of personal relations and responses, a living and evolving community of creativity and compassion. Education of this sort means more than teaching the facts and learning the reasons so we can manipulate life toward our ends. It means being drawn into personal responsiveness and accountability to each other and the world of which we are a part” (pp. 14, 15). “Adam and Eve were driven from the Garden because of the kind of knowledge they reached for — a knowledge that distrusted and excluded God. Their drive to know arose not from love but from curiosity and control, from the desire to possess powers belonging to God alone” (25). “Educating toward truth does not mean turning away from the facts and theories and objective realities. If we devote ourselves to truth, the facts will not necessarily change (though some may, since every fact is a function of a relationship). What will change is our relation to the facts, or the world that the facts make known. Truth requires the knower become interdependent with the known” (pp. 31, 32). “With few exceptions, the classes I was involved in [as a student] revolved around the activity and authority of one person — the teacher….Though some classes offered time for discussion, I seldom felt that I was being invited to teach the teacher, or even my fellow students — and seldom did I feel the impulse to try” (p. 33). “I am not against lecturing, listening, and memorization. Done properly in the right context each of them has a role in creating the community of relatedness called truth. But in my educational experience, too much of the lecturing was authoritarian, to much of the listening was unengaged, too much of the memorization was mechanical — and the ethos of too many classrooms was destructive of community” (pp. 33, 34). “First, in the conventional classroom the focus of study is always outward — on nature, on history, on someone else’s vision of reality” (p. 34). “If we believed that knowing requires a person relation between the knower and the known…our students would be invited to learn by interacting with the world, not be viewing it from afar. The classroom would be regarded as an integral, interactive part of reality, not a place apart. The distinction between “out there” and “in here” would disappear; students would discover that we are in the world and the world is within us; that truth is not a statement about reality but a living relationship between ourselves and the world” (p. 35). “Second, because conventional education neglects the inner reality of teacher and students for the sake of a reality “out there,” the heart of knowing self is never held up for inspection, never given a chance to be known….too many educated people today…are capable of functioning with competence in a technological society, but they are possessed by the same inner darkness which engulfed Adam and Eve” (pp. 34, 35). “A third feature of the conventional classroom is its tendency to isolate the knowing self. The gathered group of students is not a true community, but a mere pedagogical convenience — the teacher can now report once to forty people rather than give the same report forty times” (p. 36). “Throughout our education we learn to manipulate in order to survive, and then we carry that habit into our postgraduate lives” (p. 38). Empowering Others Or Seeking Power? “Why does this pedagogy persist? The critics come closer to the answer by suggesting that this style of teaching persists because it gives teachers power. With power comes security: the security of controlling the classroom agenda, of avoiding serious challenges to one’s authority, of evading the embarrassment of getting lost in territory where one does not know the way home” (p. 39). “Our persistent attraction to objectivist teaching and learning is the saga of Adam and Eve in history, not myth. We want a kind of knowledge that eliminates mystery and puts us in charge of an object-world. Above all, we want to avoid a knowledge that calls for our own conversion. We want to know in ways that allow us to convert the world — but we do not want to be known in ways that require us to change as well. To learn is to face transformation. To learn the truth is to enter into relationships requiring us to respond as well as initiate, to give as well as take” (pp. 39, 40). “Christian faith in its original version…is centered on a person who said, ‘I am…the truth.’ Jesus did not say ‘I will speak the words to you’ or ‘I will tell you about the truth’; he claimed to embody the truth in his person. To those who wish to know the truth, Jesus did not offer propositions to be tested by logic or data to be tested in the laboratory. He offered himself and his life. Those who sought truth were invited into relationship with him, and through him with the whole community of the human and nonhuman world” (p. 47). “We will find truth not in the fine points of our theologies or in our organizational alliances but in the quality of our relationships — with each other and with the whole created world” (p. 50). “To sit in a class where the teacher stuffs our minds with information, organizes it with finality, insists on having the answers while being utterly uninterested in our views, and forces us into a grim competition for grades — to sit in such a class is to experience a lack of space for learning. But to study with a teacher who not only speaks but listens, who not only give answers but asks questions and welcomes our insights, who provides information and theories that do not close doors but open new ones, who encourages students to help each other learn — to study with such a teacher is to know the power of a learning space” (pp. 70, 71).